A murder in the silent after-hour halls of the Louvre museum reveals a sinister plot to uncover a secret that has been protected by a clandestine society since the days of Christ. 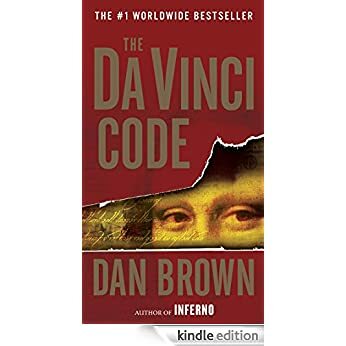 The victim is a high-ranking agent of this ancient society who, in the moments before his death, manages to leave gruesome clues at the scene that only his daughter, noted cryptographer Sophie Neveu, and Robert Langdon, a famed symbologist, can untangle. The duo become both suspects and detectives searching for not only Neveu's father's murderer but also the stunning secret of the ages he was charged to protect. Mere steps ahead of the authorities and the deadly competition, the mystery leads Neveu and Langdon on a breathless flight through France, England, and history itself. This book has been around for over 10 years, but I just got around to reading it earlier this month. It is a compelling read, with lots of twists and turns. I enjoyed learning about the secret society, the symbolism and the historical theory. It was by no means a boring read. This book, however, followed a formula and one that I am familiar with. If you have read one book with historical connections and a mystery, you've read them all. Historical secret, secret society protecting the secret, another society wanting to uncover the secret, mystery that needs solving, one person working to solve the mystery can trace ancestry back to the original historic event. Throw in a sub-plot involving a family secret and a long lost family member, and you've got your complete formula. Final verdict: Worth a read, but note if you are familiar with this genre, you've already heard the story. I would recommend this book and will likely read it again. Loved that book... great to be co-hosting the Fun In the Sun Giveaway with you!